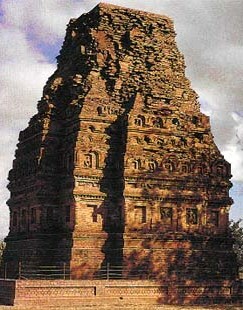 Bhitargaon Temple, located about 32 km south of Kanpur at Bhitargaon, is a 6th century temple constructed with large bricks and mud on a high terrace of 15.41 meter. The art work of the temple is similar to the Gupta period and the elaborate carvings on the exterior brick and terracotta panels shows the skillful craftsmanship of the workers. The interior of the temple consists only the sanctum and the porch. The sanctum which resembles tri-ratha stands incomplete indicating the absence of an upper chamber. The temple has a central offset on three sides and there is an entrance hall, which is connected by a rectangle passage. The walls are adorned with figures of animals, birds, beasts and sculptures depicting various divinities, myths and stories. Built in the 6th century during the Gupta Empire, it is the oldest remaining Hindu shrine with a roof and a high Sikhara, though its upper chamber did sustain some damage in the 18th century. The construction material is bricks and terracotta. The terracotta plaque reproduced above is now housed in the Brooklyn Museum, U.S.A. On stylistic grounds it can be ascribed to the fifth century and & also be presumed to have originally belonged to the brick temple of Bhitargaon, Kanpur District, Uttar Pradesh. The plaque has been described by Dr. Army Poster (Figures in Clays from Ancient India, No. 52, Brooklyn, 1973) and by Dr. Pratapaditya Pal (The Ideal Image: The Gupta Sculptural Tradition and Its Influence, Fig. 28, p.81, the Asiatic Society, Inc. 1978). The size of platform on which the temple is built is 36 feet*47 feet. The santum is 15 feet * 15 feet internally. The santum is double story. The wall thickness is 8 feet. The total height from ground to top is 68.25 feet. The terracotta sculpture depicts both secular and religious theme such as deities like ganesha adi virah mahisasaurmardani and river goddess. 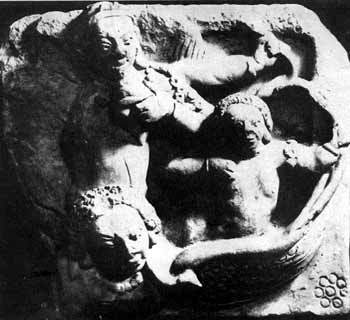 Myths and stories representing abduction of sita and the penance of nara and naryan. Shikara is a stepped pyramid and got damaged by thunder in 1894. The first story of sanctum felled in 1850. Vaulted arch is used here for the first time any where in India.